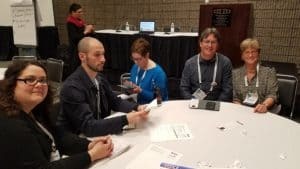 The American Library Association (ALA) today announced the top books, video, and audiobooks for children and young adults at the Youth Media Awards at the Midwinter Meeting & Exhibits in Atlanta. 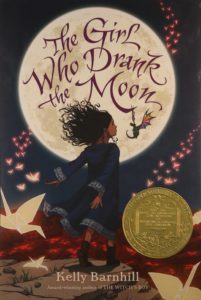 The Girl Who Drank the Moon, written by Kelly Barnhill, is the 2017 Newbery Medal winner. The book is published by Algonquin Young Readers, an imprint of Algonquin Books of Chapel Hill, a division of Workman Publishing. 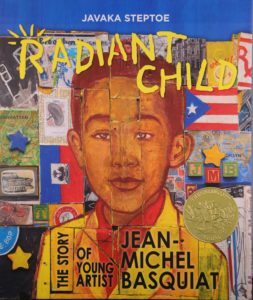 Radiant Child: The Story of Young Artist Jean-Michel Basquiat, illustrated by Javaka Steptoe is the 2017 Caldecott Medal winner. The book was written by Javaka Steptoe and published by Little, Brown and Company, a division of Hachette Book Group. March: Book Three, written by John Lewis and Andrew Aydin, is the King Author Book winner. The book is illustrated by Nate Powell and published by Top Shelf Productions, an imprint of IDW Publishing, a division of Idea and Design Works. Radiant Child: The Story of Young Artist Jean-Michel Basquiat, illustrated by Javaka Steptoe, is the King Illustrator Book winner. The book is written by Javaka Steptoe and published by Little, Brown and Company, a division of Hachette Book Group. The Sun Is Also a Star, written by Nicola Yoon, is the Steptoe author award winner. The book is published by Delacorte Press, an imprint of Random House Children’s Books, a division of Penguin Random House. Rudine Sims Bishop is the winner of the Coretta Scott King–Virginia Hamilton Award for Lifetime Achievement. The award pays tribute to the quality and magnitude of beloved children’s author Virginia Hamilton. Bishop is a winner of numerous awards and has served as a respected member of many book awards committees over the course of her long and distinguished career. Her influential writing, speaking, and teaching articulates the history and cultural significance of African-American children’s literature. Her globally cited work, “Mirrors, Windows and Sliding Glass Doors,” has inspired movements for increased diversity in books for young people, and provides the basis for the best multicultural practice and inquiry for students, teachers, writers and publishing houses. March: Book Three, created by John Lewis, Andrew Aydin, and Nate Powell, is the 2017 Printz Award winner. The book is published by Top Shelf Productions, an imprint of IDW Publishing. Six Dots: A Story of Young Louis Braille, written by Jen Bryant, illustrated by Boris Kulikov and published by Alfred A. Knopf, an imprint of Random House Children’s Books, a division of Penguin Random House, wins the award for young children (ages 0–10). as brave as you, written by Jason Reynolds and published by Atheneum Books for Young Readers, an imprint of Simon & Schuster Children’s Publishing Division, is the winner for middle grades (ages 11–13). When We Collided, written by Emery Lord and published by Bloomsbury Children’s Books is the winner for teens (ages 13–18). In the Country We Love: My Family Divided, by Diane Guerrero with Michelle Burford, published by Henry Holt and Co.
Ryan Swenar of Dreamscape Media, producer of Drum Dream Girl: How One Girl’s Courage Changed Music, is the Carnegie Medal winner. Adapted from Margarita Engle’s book, a girl in 1930s Cuba aspires to play the drums, a privilege afforded only to boys. Based on the life of Chinese-African-Cuban Millo Castro Zaldarriaga, this story demonstrates how the power of persistence can break barriers, shatter expectations, and make one’s dreams a reality. The 2017 winner is Nikki Grimes. The award honors an author or illustrator whose books, published in the United States, have made, over a period of years, a substantial and lasting contribution to literature for children. Grimes’s award-winning works include Bronx Masquerade, which won the 2003 Coretta Scott King Author Award, and Words with Wings, the recipient of a 2014Coretta Scott King Author Honor. In addition, she received the Virginia Hamilton Literary Award in 2016 and the NCTE (National Council of Teachers of English) Award for Excellence in Poetry for Children in 2006. The 2017 winner is Sarah Dessen. Her books include: “Dreamland,” “Keeping the Moon,” “Just Listen,” “The Truth about Forever,” “Along for the Ride,” “What Happened to Goodbye?” and “This Lullaby,” all published by Viking Children’s Books, an imprint of Penguin Young Readers Group, a Penguin Random House Company. Naomi Shihab Nye will deliver the 2018 May Hill Arbuthnot Honor Lecture. 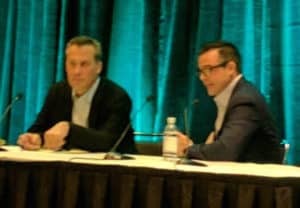 The award recognizes an author, critic, librarian, historian, or teacher of children’s literature, who then presents a lecture at a winning host site. The daughter of a Palestinian father and an American mother, Shihab Nye grew up in St. Louis, Jerusalem, and San Antonio, Texas. The author and/or editor of more than 30 books for adults and children, her latest for young people, The Turtle of Oman, was chosen as a 2015 Notable Children’s Book by ALA. She has received four Pushcart Prizes, was a National Book Award finalist, and has been named a Guggenheim Fellow, among her many honors. Cry, Heart, But Never Break is the 2017 Batchelder Award winner, which is given to an outstanding children’s book originally published in a language other than English in a country other than the United States, and subsequently translated into English for publication in the United States. Originally published in Danish in 2001 as Græd blot hjerte, the book was written by Glenn Ringtved, illustrated by Charolotte Pardi, translated by Robert Moulthrop, and published by Enchanted Lion Books. Anna and the Swallow Man, produced by Listening Library, an imprint of the Penguin Random House Audio Publishing Groups, is the 2017 Odyssey Award winner, which recognizes the best audiobook produced for children and/or young adults, available in English in the United States. The book is written by Gavriel Savit and narrated by Allan Corduner. Lowriders to the Center of the Earth, illustrated by Raúl Gonzalez, is the Belpré Illustrator Award winner. It was written by Cathy Camper and published by Chronicle Books. Juana & Lucas, written by Juana Medina, is the Pura Belpré Author Award winner. The book is illustrated by Juana Medina and published by Candlewick Press. The awards honor a Latino writer and illustrator whose children’s books best portray, affirm, and celebrate the Latino cultural experience. The Princess and the Warrior: A Tale of Two Volcanoes, illustrated and written by Duncan Tonatiuh and published by Abrams Books for Young Readers, an imprint of ABRAMS. 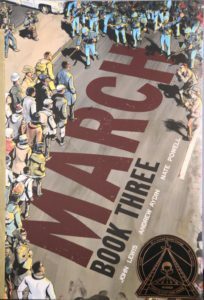 March: Book Three, written by John Lewis and Andrew Aydin and illustrated by Nate Powell, is the Sibert Award winner. The book is published by Top Shelf Productions, an imprint of IDW Publishing, a division of Idea and Design Works. Magnus Chase and the Gods of Asgard: The Hammer of Thor, written by Rick Riordan and published by Disney Hyperion, an imprint of Disney Book Group, and If I Was Your Girl written by Meredith Russo and published by Flatiron Books, are the 2017 recipients of the Stonewall Book Awards – Mike Morgan & Larry Romans Children’s & Young Adult Literature Award, respectively. The annual awards recognize English-language children’s and young adult books of exceptional merit relating to the gay, lesbian, bisexual, and transgender experience. We Are Growing: A Mo Willems’ Elephant & Piggie Like Reading! Book, written by Laurie Keller. The book is published by Hyperion Books for Children, an imprint of Disney Book Group. The Serpent King, written by Jeff Zentner, is the 2017 Morris Award winner. The book is published by Crown Books for Young Readers, an imprint of Random House Children’s Books, a Penguin Random House Company. March: Book Three, created by John Lewis, Andrew Aydin, and Nate Powell, is the 2017 Excellence winner. The book is published by Top Shelf Productions, an imprint of IDW Publishing. This Land Is Our Land: A History of American Immigration, written by Linda Barrett Osborne and published by Abrams Books for Young Readers, an imprint of ABRAMS. 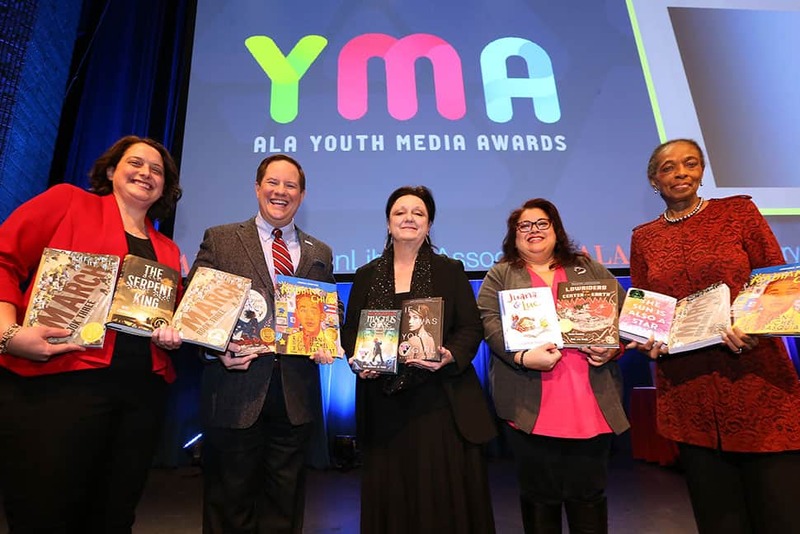 For more information on the ALA youth media awards and notables, please visit ala.org/yma.